I’m baaack! I see you’ve all been busy guessing what I’m stitching (those of you who haven’t yet should go here and do so now), and I will put up a new picture for you soon, but right now I would like to talk about rugby. I had to take a photo of the Newcastle United sign without the horrid adverts! Number 20 on my 35 before 35 was to attend a world cup rugby match. I thought since it was taking place in England it was an opportunity that shouldn’t be missed! 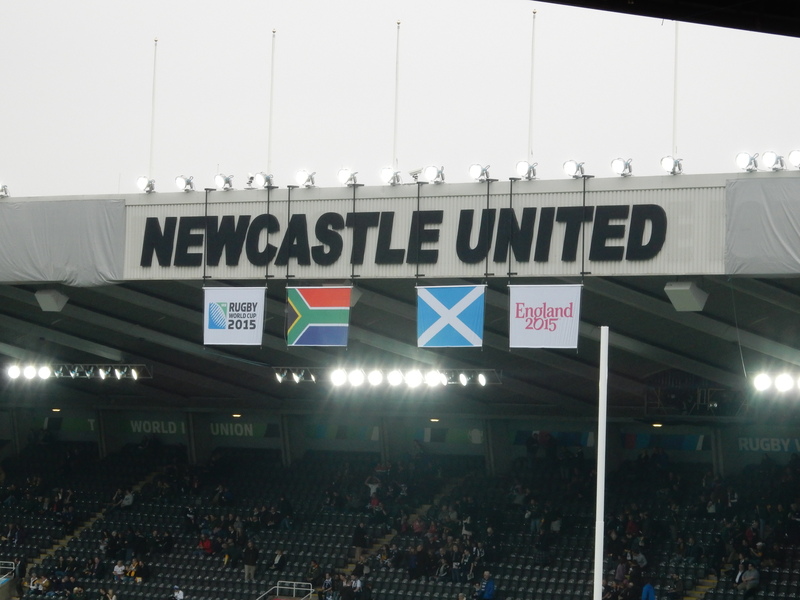 As it turned out, I actually attended three matches – all the ones that were taking place at St James’ Park (Newcastle United FC’s home ground). We got to see South Africa vs Scotland, New Zealand vs Tonga and Samoa vs Scotland. The two Scotland ones had the best atmosphere – so many Scots had come down for it that it was almost like a home game for Scotland! The best match, surprisingly, was Samoa vs Scotland! New Zealand won theirs but were fairly disappointing – obviously they ran all over little Tonga but they didn’t play nearly as well as I was expecting them to. Scotland played terribly against South Africa and thoroughly deserved the beating they got! But Samoa vs Scotland was a fairly even match and definitely the most exciting of the three. In the end Scotland deservedly won – although I was actually torn with that match as if Scotland had lost Japan – who had been doing surprisingly well during the group phase – would have gone through to the next stage. Anyway, enough talking – here are a few photos. Celebrating a try – I love the facial expression! It wasn’t always that easy to tell what was going on from the stands (especially when we were nowhere near the screen! ), but all three matches were great fun to attend and I would definitely do it again! So, another item off the list. What’s next? I wasn’t sure what to post for this week’s Look Up, Look Down, so I started randomly going through the photos on my computer and came across this one from January 2011, when Jan an I spent New Year in Edinburgh. It was taken from Holyrood Park, looking down on the city. At the back of the photo you can see Edinburgh Castle. Here’s another photo, taken from the same park/hill. This time, you can see Holyrood Palace. To see other interpretations of the challenge and join in yourself, check out Travel With Intent’s blog post. Coincidentially, she has also used views of Edinburgh this week – I swear I didn’t know that last night when I uploaded the photos ready to write this post today! Want even more Edinburgh? Take a look at this post that I wrote earlier this year.